At 3D Apartments we have fully equipped apartments to rent. You can enjoy Prague and sleep in a quite area yet still to be close to the city center. 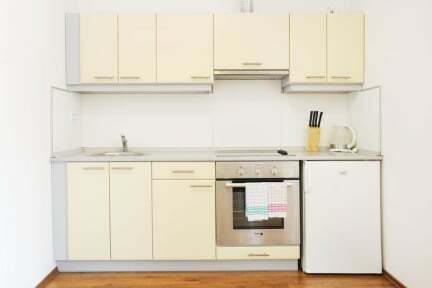 Our apartments have kitchen, bathroom, living room and one or two bedrooms. Our clients can use fitness and wellness service including swimming pool, sauna, steam and jacuzzi. All of it free of charge! We also provide parking garage. 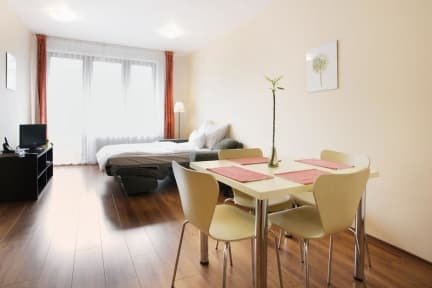 Our apartments are located at metro station Krizikova, one stop from Florenc bus station. We are 50m from metro station Křižíkova on 'B' line. Next to supermarket Albert. We are 10 minutes by metro from the Prague hl.n. - Main Train Station. Our Double Suites are apartments with one double bed room, living room with a fully equipped kitchenette and bathroom. Each has a balcony. The Large Suites are two bedrooms apartments with one double bed and one single bed. Living room with a fully equipped kitchenette and balcony. Bathroom with a bath. The Grand Suites are two bedroom apartment, each has one double bed. Some Grand suites have in the other bedroom one more double bed, some have two single beds. Living room with a kitchenette and balcony. Bathroom with a bath. Our Superior Suites are 4 bedrooms apartment with a living room and a kitchenette. Two bathrooms. Balcony and a nice view. Payment upon arrival by cash (CZK or EUR), credit cards, debit cards (Visa, EC/Mastercard, Amex).